Android is one of the coolest platforms designed to surprise you every time you explore. With Android you can do stuffs that can only be dreamt by iOS or Windows users. With lots of stuff which you can do on Android platform, we have shortlisted five best tricks – which according to us, all Android users should know. Let’s see how to do it! 4. Adjust the window and transition animation scales to .5x or turn them off completely. Losing your phone is one of the worst things that can happen. These devices contain sensitive information and private data. If your phone falls into wrong hands it could put you in a world of trouble. These are apps you can download to help in the event of a lost phone, but in order for them to work you need to have them installed before something bad happens. Luckily there is a built-in way to find your lost phone and even wipe all of your personal data. 4. Now you can see the location, ring it, lock it, or erase it. When you’re playing music on your phone the lockscreen gets taken over with beautiful album art and media controls. These controls allow you to go back, play/pause, or skip to the next song without having to fully unlock the device. However, that’s not all you can do with those buttons. A little now feature is the ability to scrub through a song from the lockscreen. It’s stupidly easy to do, but not an obvious feature. On devices with software buttons you can launch Google Search by swiping up on the home button. Some devices with hardware buttons allow you to do this with a long-press on the home button. An app called Home Button Launcher allows you to use this gesture to launch any app you would like. This gives you quick access to your favourite apps from anywhere on the phone. If you don’t rely on location data a lot you could be saving some precious battery life. Android has a built-in setting that allows you to determine how you want your phone to find your location. There are three different modes: high accuracy, battery saving and device only. This trick isn’t for everyone but if you don’t care about location it’s a nice way to save some juice of your battery. 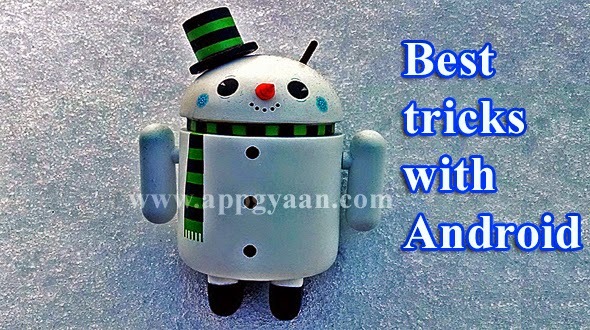 We are aware that some smart Android users may be using some of the above discussed tips. It might be that we must have missed some cool tips, please share your tips and suggestions in comments section below. You can subscribe to our RSS Feed for all the latest of APP GYAAN directly into your Inbox.